As mentioned in the previous podcast, a three-judge panel of the 5th Circuit Court of Appeals decided against the rule. This month, Julie summarizes the current status of the rule and what the Securities and Exchange Commission (SEC) has up their sleeves. Kelli explains that earlier in May, the Trump administration released a plan to lower the cost of prescription drugs with goals like increasing competition and reducing out-of-pocket spending for patients. Another idea is to require drug companies to disclose the list prices of drugs in TV ads. Expanding on the topic of drug costs and transparency, the podcast team takes a deep dive into the complicated and costly world of specialty drugs. The retail price of specialty drugs increased by almost 10% in 2015, following nine years of increases. While specialty drug prescriptions will be issued to only 1% to 2% of participants on average, their cost can account for one third to half of the entire prescription drug spend. Discover why specialty drugs are priced so high, the science behind the drugs, and what plan sponsors can do to control costs. 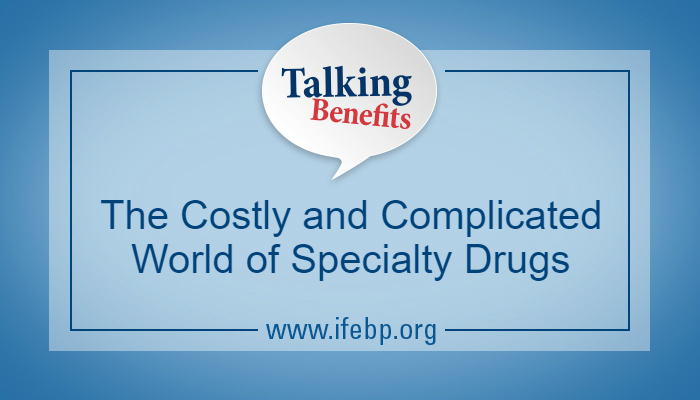 After you take a listen, e-mail podcast@ifebp.org if you have any specialty drug-related stories of your own to share. Great information, I will be giving some of these recommendations to my leadership team.